Smith’s Report no. 185 of October 2011 published an article by Arthur Butz entitled “Two Cutting-Edge Works of Holocaust Revisionism“ (pp. 3-7). [i] It was a review of Samuel Crowell’s recent book The Gas Chamber of Sherlock Holmes, and Other Writings on the Holocaust, Revisionism, and Historical Understanding (Nine-Banded Books, Charleston, WV, 2011), and of my own Auschwitz: The Case for Sanity (The Barnes Review, Washington, 2010), which is the American edition of Le camere a gas di Auschwitz (Effepi, Genoa, 2009). 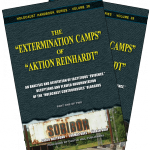 On 27 January 2010 this blog carried a chapter-by-chapter presentation of the most extensive revisionist study on Auschwitz to date, Le camere a gas di Auschwitz. Studio storico-tecnico sugli “indizi criminali” di Jean-Claude Pressac e sulla “convergenza di prove” di Robert Jan van Pelt by Carlo Mattogno (Effepi, Genoa 2009). We are happy to inform our readers that this formidable study is now available for order in English translation from TBR Books as Auschwitz: The Case for Sanity. 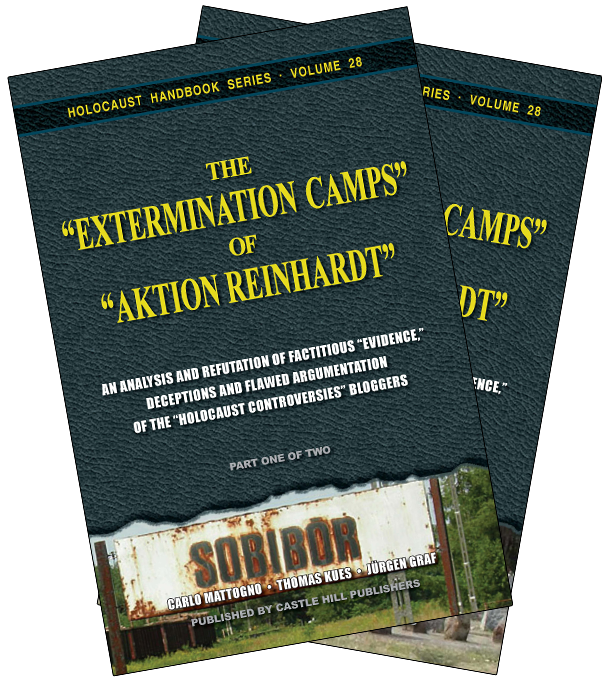 A Historical & Technical Study of Jean-Claude Pressac’s Criminal Traces and Robert Jan van Pelt’s Convergence of Evidence (being volume 22 of the Holocaust Handbooks series). Due to its length (756 pages) it has been divided into two volumes sold as a set. Carlo Mattogno’s Auschwitz: The Case for Sanity is available from the online CODOH bookstore and will be stocked from 1 December. «Therefore, by omitting any mention of these prominent documents Carlo Mattogno has engaged in a gross and unforgivable deception. We hope to treat Mattogno’s other arguments from this and other books in the future, but it has already been established that one cannot rely on him to present the evidence fairly». Two important document sources to which I have had access recently prompt me to write a sequel, with some revisions, to the two articles I have published earlier on the present subject , in order to bring the matter up to date. In his book Stolen Identity. Auschwitz Number A-7713 , Miklos Grüner, a Hungarian Jew and former deportee to Auschwitz (ID number A-11104) and to Buchenwald (120762), accuses Elie Wiesel, Nobel Peace Prize laureate of 1986, to have appropriated the identity of another Hungarian Jewish inmate of Auschwitz and Buchenwald, Lazar Wiesel, as well as the Yiddish publication Un di velt hot geschwign (And the world remained silent) which Lazar Wiesel published in Buenos Aires in 1956. Grüner’s account contains a sizable documentation, parts of which are new, although it must be said that the author’s interpretation of some of these documents appears somewhat questionable. After the publication of my article Elie Wiesel: “The Most Authoritative Living Witness” of The Shoah? I learned about a Hungarian website on which Miklòs Grüner has compiled a substantial documentation regarding this subject. Grüner has, for years, made highly commendable efforts to ascertain Elie Wiesel’s personality, but his work has been passed by for too long. I will not go into Grüner’s denouncements of identity theft on the part of the Nobel laureate, levelled against various authorities and will limit myself to the corresponding documents. On 27 January 2010, the tenth “Holocaust Remembrance Day”, Elie Wiesel was invited into Montecitorio Hall, the seat of the Chamber of Deputies of the Italian Republic where he had the opportunity to give a brief speech. The president of the Chamber, Gianfranco Fini, introduced him as “the most authoritative living witness of the horrors of the Shoah among the survivors of the Nazi concentration camps”. But is he really a witness? Is Elie Wiesel an impostor?